1. What concentration are you considering? What concentration are you considering? 2. What is the reason for pursuing your Online MBA? What is the reason for pursuing your Online MBA? 3. Complete the form to download the brochure. Our world-class program can help prepare you to make an immediate impact on important business challenges faced by your organization today. Why choose our Online MBA? 80% said they had a very good to outstanding experience in the program. 69% received a salary increase since completing the program. More than half received a salary increase of 10% or more. *Source: Results are based on a survey conducted in September 2016 of Northeastern University Online MBA graduates. The results reflect the compilation of survey response results and may not reflect the experiences of all graduates. Learn More About Our Online MBA Degree Program. 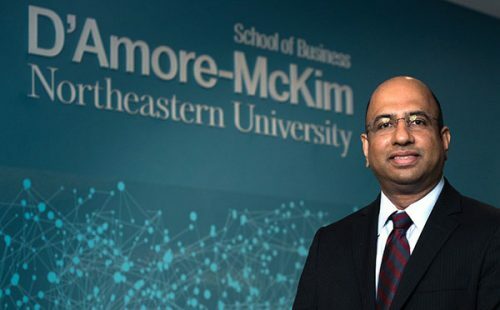 Thank you for your interest in Northeastern University’s D’Amore-McKim School of Business! I am thrilled to be the school’s inaugural Dunton Family Dean, and I pledge to invest my time and energy into making our student experience not only stimulating and enriching, but literally life-changing, as they become even better thinkers who are truly prepared for the future of work. Our business school has built and sustained a legacy of excellence for nearly 100 years. We’re truly global in every sense of the word. We’re innovative. We’re agile. We’re resilient. We have a strong global network. We attract some of the best and brightest faculty and student talent from all over the globe. Our expertise in experiential learning is pioneering and transformative. We’re in Boston – one of the world’s most vibrant talent economies. We have something very special here. D’Amore-McKim faculty, staff, students, alumni, donors, and friends are all invested in each other’s success, and collectively this community has helped to raise the standards of our school. Our trend for the past decade has been to move consistently upward. I am committed to helping continue on this trajectory as we inspire those around us through our research, our teaching, and our engagement with the world.